Bruschetta is an Italian appetizer recipe made toasted crusty bread with your favourite toppings. Here I used tomato, bell peppers, onion and sweet ripe pineapple as toppings. Using pineapple juice as a spread makes the bread tangy and sweet with its flavour. I used homemade sourdough bread (Recipe link), alternatively any bread can be used. In a large bowl, mix onion, tomatoes, pine apple, bell peppers/capsicum using a large metal spoon and taking care not the mash any tomatoes/veggies. Slice the baguette loaf diagonally, into thick slices and spread pinapple juice (or any sauce of choice) , top it up with topping mixture, cheese. Pre-heat the oven at 200deg c, line the baking tray. Arrange the topped bruschetta slices and bake for 4-5minutes/until cheese melts. Toppings can be altered as per the taste. This can be relished even without toasting. Posted on October 15, 2014, in Appetizers, International, Main Course and tagged Italian Bruschetta. Bookmark the permalink. 32 Comments. Lovely combination of flavours, Chitra! 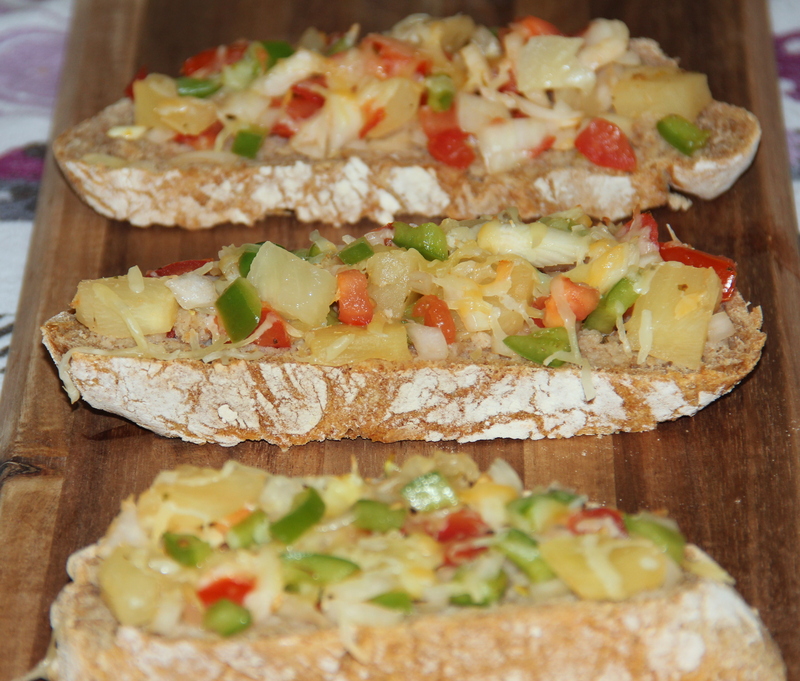 Pineapple bruschetta – genius! Such a good missing summer already treat. cette recette a l’air tres bon!appetissant non! Awesome summery festive bruschetta! I’ve never had a pineapple bruschetta but why not? Thank you for bringing! Have a healthy happy weekend! Thank you Sue for your encouraging comment which boosts me up to try and explore more and more…. happy FF. .. This sounds fabulous. I love the idea of the pineapple juice. Thanks for sharing on Real Food Fridays blog hop. Pinned & twitted.